The Russian authorities are investigating whether a sunken Soviet nuclear-powered submarine, the K-27, can be safely raised so that the uranium in its reactors may be removed. At the height of the Cold War, in 1968, the K-27 met with disaster when radiation escaped from one of its reactors during a voyage in the Arctic. Vyacheslav Mazurenko, then 22, was serving as a chief warrant officer (CWO) on the vessel, which now lies abandoned in the Arctic's Kara Sea. Today he lives in Ukraine and he told BBC Russian what happened. "We were on a five-day trip to check everything was working normally, before a 70-day round-the-world mission without resurfacing," he said. "It was the end of the third day and everything seemed to be going well. The crew was really tired." The mission would be to collect data about Nato and other enemy bases. K-27 had two experimental liquid metal-cooled reactors - a design never tried before in the Soviet navy. Nuclear power enabled the sub to stay underwater for weeks without resurfacing and without having to refuel. "At 11:35 everything was peaceful," he said. "The bulkheads were open. I was in the fifth compartment, next to the fourth compartment with the two nuclear reactors, talking to some crew members there. We suddenly noticed some people running. "We had a radiation detector in the compartment, but it was switched off. To be honest, we hadn't paid much attention to the radiation dosimeters we were given. But then, our radiation supervisor switched on the detector in the compartment and it went off the scale. He looked surprised and worried." They did not understand what had happened immediately because the radioactive gas had no odour or colour. But two hours later, some crewmen came out of the fourth compartment - and some of them had to be carried, because they could not walk, CWO Mazurenko said. He put it down to fatigue, because the crew had spent three days with almost no sleep. The submarine headed back to its base on the Kola Peninsula, by the Barents Sea, which took five hours. As the sub approached, the base's command fled the dockside, because special radiation alarms onshore were emitting a deafening roar, CWO Mazurenko recalled. Soon after, the base commander picked up the captain in a car, but most of the crew had to walk 2km (1.2 miles) back to their barracks under their own steam. Several specialist crew members were left on board the toxic sub for about a day, because they were under orders to keep watch. Some have blamed K-27's Capt Pavel Leonov over the accident, but CWO Mazurenko says the captain faced a life-or-death choice. "When the sub surfaced to make the trip back to the docks, the division ordered it to cut its engines and await special instructions. The captain, however, decided to keep going, because if the sub stopped for several hours nobody would survive long enough to get it back to base." The crew of 144 were poisoned - nine died of radiation sickness soon after the emergency, and the others were ill for years before their premature deaths. K-27 went into service in 1963, about five years after construction had started. It was very expensive and took longer to build than other Soviet nuclear submarines. So the sailors called it the "Little Golden Fish" - or "Zolotaya Rybka" in Russian - after a magical, fairy-tale fish which makes people's wishes come true. "In Soviet times, we were told that our subs were the best, and we had to be different from the 'imperialists'. But the first subs were far from perfect. Soviet leader Nikita Khrushchev said: 'We'll catch up with you and overtake you'. They kept churning out new subs, regardless of the risk to people," CWO Mazurenko said. The crew were part of the military elite. They got lemons and oranges - citrus fruit that most Soviet citizens, battling daily with shortages, never saw. The crew were told that their reactors were extremely safe and could not suffer the breakdowns that had plagued some other Russian submarines in the past, CWO Mazurenko said. "When the assessment commission came round, its members were often afraid to visit the reactor compartment. They always tried to avoid it, but Captain Leonov actually sat on one of the reactors, to show them how safe it was." However, CWO Mazurenko says radioactive particles had been detected aboard the submarine from the very start. He was among 10 lucky crew members to be sent to a Leningrad hospital within a day of the disaster. The fate of the rest of the crew was in the hands of the Communist Party in Moscow. Five days after the accident, the rest were taken to Leningrad - now called St Petersburg. They were each isolated from the outside world. 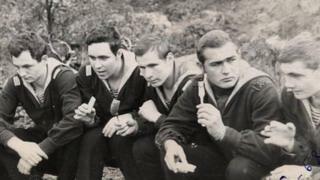 Many Soviet sailors and officers were ordered to donate blood and bone marrow, knowing nothing about the accident, which remained an official secret for three decades. K-27 officers were later warned they should not have children for five years and were given regular check-ups, but there was no proper medical follow-up for the ordinary submariners, according to CWO Mazurenko. Many of them were declared "healthy" by military doctors, despite their illnesses, he added. On the medical certificate they received 25 years after the disaster, it simply read: "Participated in nuclear accident elimination on the submarine. Exposed to radiation." Despite what happened, Vyacheslav Mazurenko told the BBC: "I do not regret that I served almost four years on this submarine, with these people." Of the original 144 crew, only 56 are still alive. Most of them became physically handicapped and they still do not know the level of radiation they were exposed to. In 1981, K-27 was sunk at a depth of just 30m (99ft) in the Kara Sea - far shallower than the depth required by international guidelines.